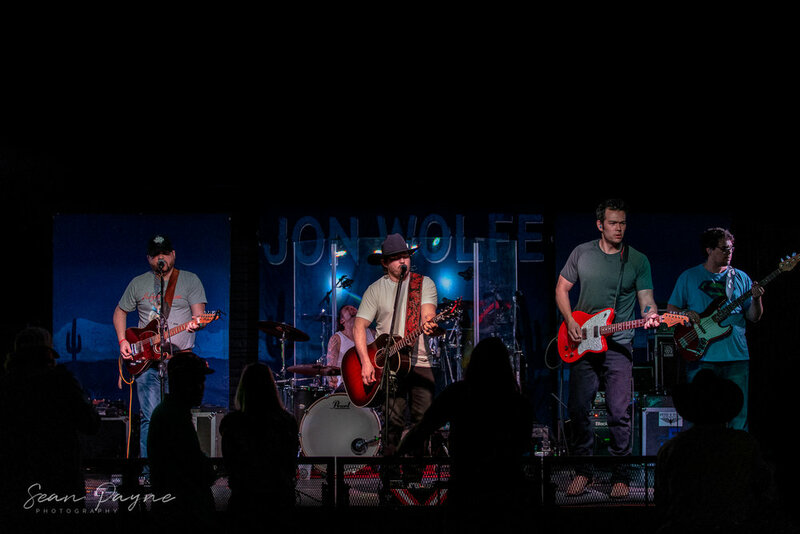 March 29th, 2019, at Tumbleweed Dancehall & Concert Venue- Jon Wolfe took the stage at the dancehall in front of a very energetic and enthusiastic group of show goers. The Tulsa, Oklahoma, native has been making a name for himself in the Texas music scene since the year 2004. Wolfe has released a total of six albums, one a re-release deluxe edition, as well as a live album, since he began his musical journey. The veteran showman brought his A game to the Dancehall on this particular night. Local band, Bryce Dicus & The Mercenaries, warmed up the early crowd with an energetic and tight set. Once completed, the energy and tension in the air started to increase. The music over the speakers continued to play tunes from Tyler Childers, Colter Wall, and the Turnpike Troubadours. The crowd was anxiously awaiting Jon Wolfe and the band to take the stage. After the stage was set, the music was lowered, and the band appeared from the curtains as the crowd burst out with excitement. Immediately the commanding presence of Jon Wolfe was felt. The singer and storyteller played some of the crowd favorites to include his hits, “Let a Country Boy Love You,” “That Girl in Texas,” “I don’t Dance,” and many more. Wolfe is an entertainer. When you buy a ticket to go to a Jon Wolfe show, you are getting great music, storytelling, and high-level showmanship. Bryce Dicus & The Mercenaries opening for Jon Wolfe. Tumbleweed Dancehall 2019. The story of Jon Wolfe and his musical career is an interesting one. Jon was born in Tulsa, Oklahoma, and was raised in Miami, Oklahoma. Like a large number of musicians, Jon’s journey began with the gospel. He grew up singing in church and began listening to classic pop music, which is regarded as having existed between the mid-1940s and mid-1950s. Wolfe moved to Chicago where he worked in the oil business and was transferred to Houston in 2003, where he was roommates with Hayes Carll. This is where his musical interest would begin to become a serious endeavor. Inspiration was derived by Wolfe to pursue a serious music career in country music after he attended an Alabama concert in Texas. He was invited to come onto the tour bus after the show and he sang a few tunes with Teddy Gentry and John Rich. Wolfe would later move to Austin, Texas and was a regular performer on the Lone Star honky tonk circuit. While on the circuit, Wolfe was able to fine tune his sound and stage presence by following in the footsteps of greatness in which he was inspired by. Acts such as George Strait, Garth Brooks, Clint Black, and Merle Haggard were his heroes, but yet Wolfe brought his own contemporary energy and vision to his work and to the stage. Jon Wolfe’s career has gone on to include the making of five studio albums, along with a live album that was recorded at John T. Floores’s Country Store. Jon released his first, self-released, album in November of 2004 titled, Almost Gone. During this time, Wolfe has also written songs for other musicians such as Clay Walker. In 2010, “She Won’t Be Lonely Long” went on to be a top five song for Walker. Joe Nichols would also record one of Jon’s songs, “I Can’t Take My Eyes Off You” for his 2011 album,It’s All Good. The discography of Jon Wolfe, while short, is very impressive. After his independent debut release in 2004, he would then go on to sign with Lex Music Group for management and formed his own label, Fool Hearted Productions. Wolfe would release his second album, It All Happened in a Honky Tonk, in September of 2010. This album would be his most successful in the fact that it produced five singles; all of them reached the top ten on the Texas Music Chart. The album would again be released by Warner Bros. Nashville in January of 2013 as a deluxe edition. The album included three new songs and debuted at number 52 on the Billboard Top Country Albums chart. The live album, It All Happened Live in a Honky Tonk from Floore’s Country Store, was released in October of the same year. After leaving Warner Bros. and signing with Tone Tree Music, Wolfe would release his third studio album, Natural Man. The album was released on March 31, 2015 and debuted at number 25 on the Billboard Top Country Albums chart. In June 2017, Wolfe would release the album Any Night in Texas. The album debuted at number 6 in the Heatseekers Albums chart and number 14 in the Independent Albums Chart making it Wolfe’s best effort to date. As the showman continues to grow and mature, so does his music. Both in a live setting, and in the studio. Fans of Jon Wolfe should be excited to see what the showman has up his sleeve for his next production.